In his previous incarnation Lord Vasupujya's soul was King Padmottar. King Padmottar ruled over Mangalavati town of Ardhapushkar island. He was a person devoted to spiritual pursuits. In later part of his life he took Diksha from Acharya Vajranabh. Reducing the tarnish of Karma by penance and spiritual practices he earned the Tirthankar-nam-and-gotra-karma and incarnated as a god in the Pranat dimension. 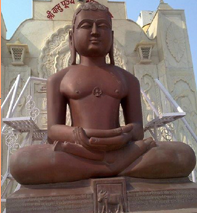 After becoming a saint, Vasupujya went roaming from place to place spreading the message of peace and religion. On the second day of Magh Shukla, he came to the same place where he started his religious journey, under the same Patal Tree. And during meditation all the ghati Karmas destroyed and he attained Kevala Gyana. The second day a Samavsharan was organized in Champa town itself and light of knowledge was spreading all over. Bhagvan Vasupujya came to Dwarka. King of Dwarka was Dwiprishtha, brother of Vasupujya ji and his one of the devotees. He came to Vasupujya ji and asked him that why did he had to kill the neighboring king Tarak. On this Bhagvan Vasupujya ji told him that in the past life he was king Parvat and there was a very beautiful girl in your kingdom, Gunmanjari. Your neighbouring king was Vindyashakti who was very powerful and cruel. He asked the girl from you and you refused to do so. He attacked your kingdom and you lost the battle. Being beaten you were very sad and depressed so, you took diksha and went on the path of devotion and meditation. But even then you could not forget and forgive Vindyashakti. So, in the next birth you became what you are today and he became King Tarak. This is why, you killed him. Hearing all this Dwiprishtha went on the feet’s of Vasupujya and took Diksha from him joined his divine army. Bhagavan Vasupujya got Nirvana in Champa town on the fourteenth day of the bright half of the month of Ashad (according to Hindu Calendar).